Editor’s note Dear Readers, The first chill winds of winter usher in the madness and the glamour that is the wedding season. Whether you’re tying the knot this year, hosting a do, or putting on the ritz as a guest, we can all be agreed on the fact that weddings in Dhaka are a big deal. This week, we bring you, not just the requisite food, beauty and fashion tips surrounding the wedding industry, but a few other sides to the biyebari shindig. Not all of them are pretty. Like our story about child marriage, and the continued struggle for some girls to beat the tide. was a bomb on board. holud attire for the bride. on a vacation and read on. negotiations did not work out! organise the rituals as joint ventures. bear the costs of the arrangements. number of guests of each party. or groom and their family members. from his/her vacation at this point! including shoes and other accessories. have many outlets all over Dhaka city. number one choice for us Bangladeshis. leather merchandise, they have it all. Tejgaon and many other places. However, this is a rather unconventional custom in Bangladesh. to find vouchers worth Tk500 each. Book your hairstylist and makeup artist. Get your final hair cut and colour. is key to feeling fit and pretty. goes behind planning the event. hen it comes to weddings – we’ve got an entire plethora of things we look forward to. There’s the glitz, the glamour, there’s the whole idea of winter chills too. However, more than anything else, what really gets us most excited about a wedding is – undoubtedly, the food. Namely, the kachhi. You can make your own kachhi, you can try your local baburchi’s kachhi and you can even travel all the way to Puran Dhaka for it but nothing has the ghee infused, rich, true blue flavour of a “biye kachhi.” That’s right – meat sliding off the bones in warm waves, the rice moist with ghee and the aloo just waiting to be smushed. And of course, the little surprises that come in the form of that odd aloo bukhara that makes an appearance – not in the serving plate, but in your mouth just as you are to go for that second mouthful. You take a pause, really letting it all mesh in, the sweetness of the aloo bukhara, the tender khashi and the full of flavour rice. There are very few of us who can’t help but love kachhi – there IS so MUCH to love, after all. It’s probably the only one-dish rice dish that needs no accompaniment. Yeah, we add some roast, we dump a pool of chutney and we chug it all down with some borhani, but really, it’s only because we can, not because we need to. We scourged through several Facebook groups, talked to those who’ve had their wedding kachhi’s slayed and those who haven’t. Read on to find out who made the cut when it came to the ultimate battle of the biryanis. is the one and only Iqbal Catering. criteria of the ideal wedding biryani. roast/tikka, beef curry, rezala etc. well cooked, but never sticky or mushy. authenticity of a real wedding biryani. Science Lab, Dhanmondi, Dhaka- 1205. Wedding Planner & Event Management. shoulders, then this is probably it. They nail the biryani and all your other catering needs while also having other event management services on offer. Mosque and opposite to Prince Plaza). backseat when it comes to topping lists. cards and sign it with our first names. as you know what to do. wedding on your way back from work. impressions are of most importance. But that is the thrill of it, isn’t it? sweet. I am sure they will appreciate it. circumstances of a wedding crash gone wrong, prepare and follow through. questions before you go crashing. “Who are you here with?” etc. your ticket out of there. for the gals, and you’re good to go. friends rather than the relatives. with a high chance of getting caught. 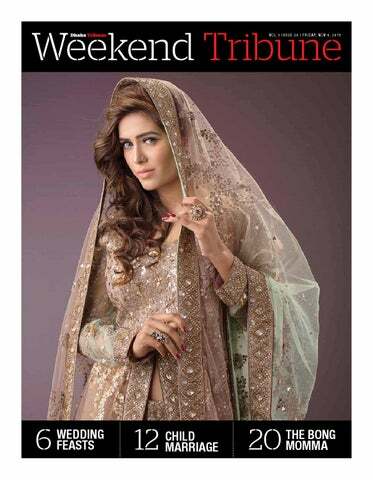 Marriage material Photos: Zia Uddin Weddings are all about the bride. What outfits will she wear? What jewellery will match the outfits? Matching purses and shoes, hair and makeup and the list goes on and on. Alright. Fine â&#x20AC;&#x201C; the groom matters too. Weddings centre around the bride and the groom and their ensembles which are planned out months and months ahead. Somewhere in this equation, family members of the couple find themselves hurrying last minute to find appropriate outfits for attending the wedding, friends try hard to not repeat the same outfits worn last wedding season, and all other guests wish their efforts put into dressing up matches the taste of the wedding biryani. We dedicate this spread to esteemed wedding guests, it is not your day, but you shall not go unobserved. Human Rights Watch (HRW) report. walked in to her home in Korail slum. – one that Rubina herself joined. his guardians, this is largely ignored. convince her out of it. Korail since she moved here in 1994.
were at much earlier stages. Thus the marriage was halted. married off before 18, the reality of child marriage is grim. Child marriage has been illegal in Bangladesh since 1929, with the Child Marriage Restraint Act (1929) placing the legal age for girls to marry at 18, and for boys at 21.
onus falls upon the kazi to stop them. could easily lie their way out. whom are not even authentic. been in a relationship with. marry, Rubina had consented to this. office, just a few feet away. and fears a 12-year-old should have. sexual abuse and abduction of girls. untouched areas of natural beauty close to Bangladesh. The place is teeming with amazing marine life – dolphins and porpoises galore. We were also quite lucky to see a whale in the distance. Our tour guide was also pretty knowledgeable and kept us mesmerised. However, one of the comments he made disturbed me a little. He mentioned that although this area has been recognised as a “Marine Protected Area,” chances are that it would not be properly protected, mainly owing to the fact that no laws currently exist to protect this place. Is this true? What kind of legal provisions would aid in the conservation of this beautiful area? marriages are anything but simple. ‘Walima’, bearing the financial burden for arranging that lies onto the family of groom. tightened under some holistic rituals. arranged marriage or a love marriage). and all other things are secondary. Bride’s price or groom’s dowry? be ‘traded with’ in this manner. affair, without pomp or ceremony. not a burden on either family. giving dowry is not part of Islam. around, without her breathing down my neck to label ourselves? to retain this aura of mystery when it comes to sharing details of his love life with others. I never feel disrespected, but sometimes I get a little suspicious. I am worried about this but I’m also too embarrassed to ask him – I don’t want him to think I’m being childish. However, secretly I want him to share his past with me and tell me more about his life just so that I can calm my insecurities. Should this be something I should worry about? my classmate and I don’t want to betray him like this. One day when they find out that I knew but I didn’t let him know, that will reflect badly on me. Should I come clean and tell her husband before he finds out and confronts me himself ? Sometimes my dear “ignorance is bliss.” However, I would undertake some searching and ask around about him. gut feeling that tells you to be aware. what it takes to be legally “married”. further to throw a party for the firani. are made up of – ups and downs. to live up to social expectations. events are also in for a hard time. not always know what to do or say. somehow they all start to make sense in a weird way. figuring out which version of your Shahrukh Khan he is this week. putting out someone else’s fire. will you end up choosing? to the wild side of things. Solved it? Email answers to weekend@dhakatribune. 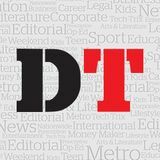 com and win one free month of the Dhaka Tribune. event are available on www. right. He is always in control. small. Show is open for all. fear. As always, we are complicit. decoration. Entry Fee is Tk50 only. girls residing in slums across Dhaka. vulnerable inhabitants of this city. was, and there it was, as clear as day. actually did give birth to Jellybean. units didn’t make it any easier either. around myself, namely, my tummy! much joy in such simplicity! hearing the story, they agreed as well. I came under to choose a good name. could still turn out evil! black and white. So the name stuck.